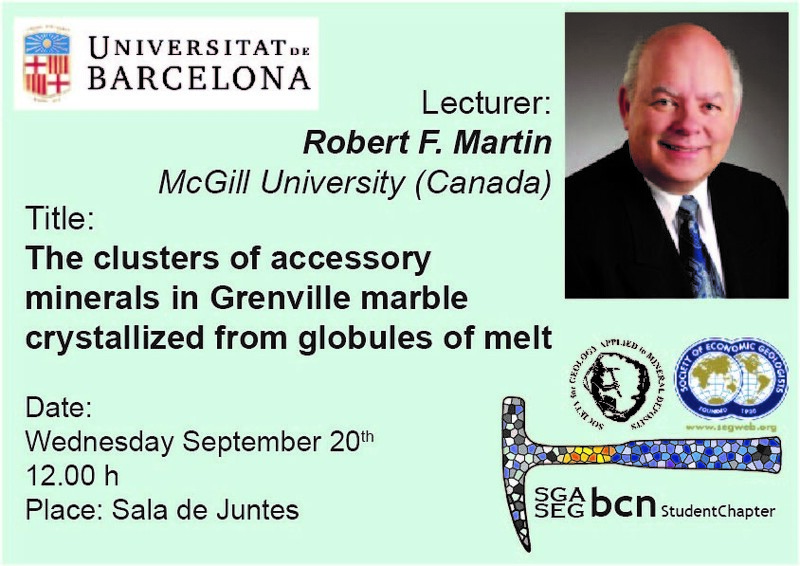 Next Wednesday September 20th professor Robert F. Martin from McGill University (Canada) will be giving the talk entitled: "The clusters of accessory minerals in Grenville marble crystallized from globules of melt". 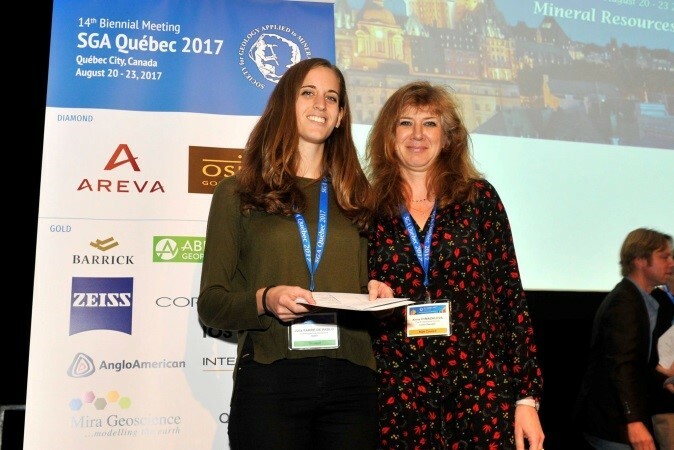 From August 20 to 23th two members of our Student Chapter, Núria Pujol Solà (president) and Júlia Farré de Pablo, attended the 14th SGA Biennial Meeting in Quebec City. 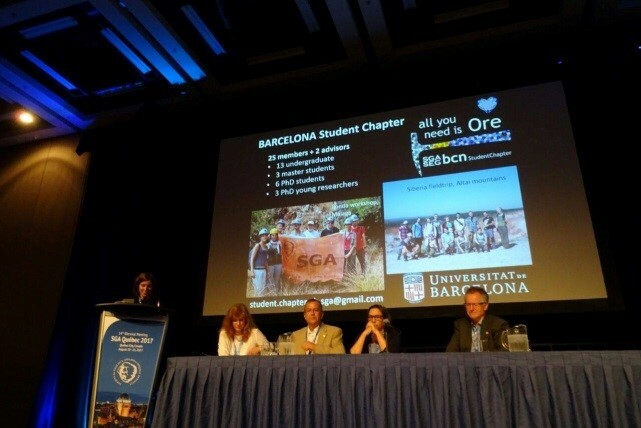 And also they represented the Barcelona Student Chapter during the SGA General Assembly and had contact with the other student chapters from around the world. Last but not least, we proudly announce that Júlia Farré de Pablo received the award for the best poster presentation! We also want to thank the SGA Educational Fund for the scholarships received to attend this meeting. 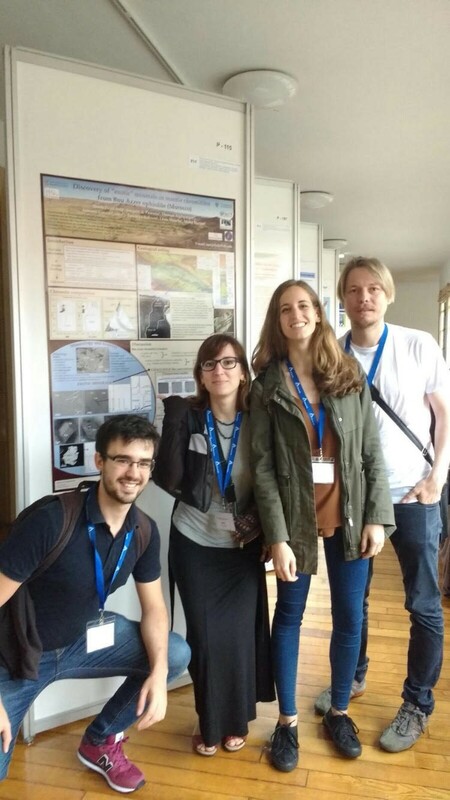 Last July, some of our members (Júlia Farré, Thomas Aiglsperger, Diego Domínguez), former members (Cristina Villanova) and our advisor Joaquín Proenza took part in the last meeting of the Spanish Society of Mineralogy, held in Oviedo (Asturias). All of them presented different topics related to ore deposits, like Platinum Group Minerals or Rare Earth Elements minerals, in short presentations of 10-15 minutes. 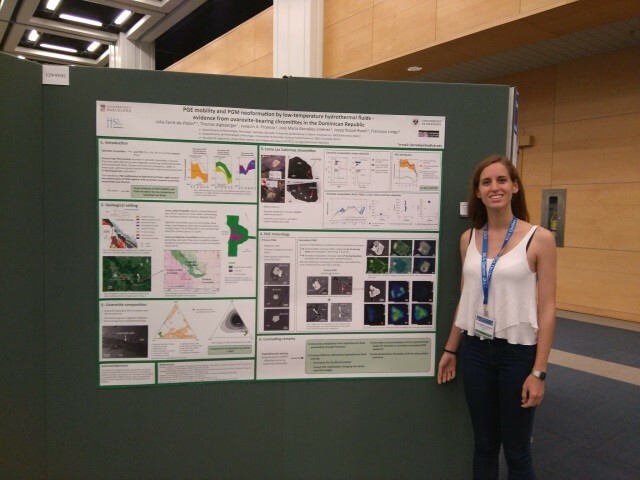 We are very proud to announce that one of our members, Júlia Farré, received a prize for her presentation entitled “The exotic composition of chromitites from the Loma Caribe ophiolite, Dominican Republic”. 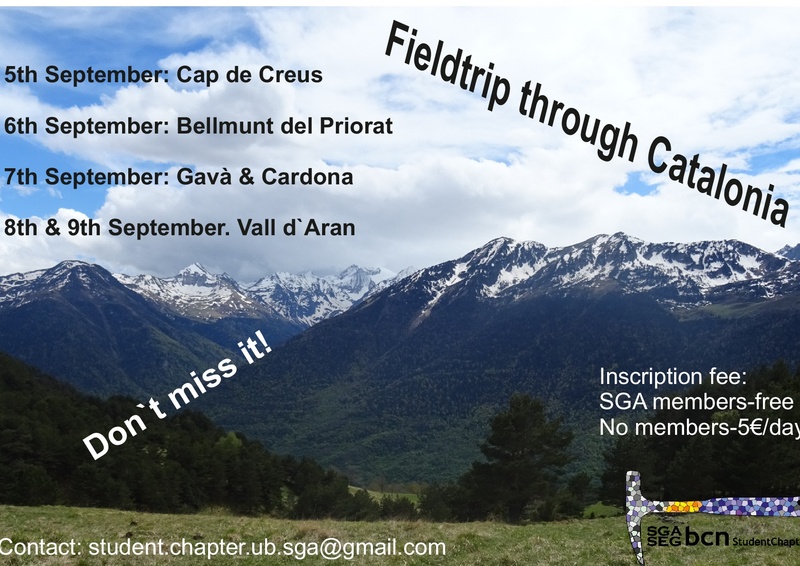 During the first week of September we have organized a feldtrip in Catalonia in collaboration with the Siberia and Prague SGA Student Chapters, make sure to make the necessary applications. Lluís Fontboté (M.Sc., University of Granada, Spain; Ph.D., Heidelberg University, Germany) is a full professor at the University of Geneva, Switzerland, where he leads a research group that is active worldwide. His main area of expertise is epithermal polymetallic deposits linked to porphyry systems, iron oxide copper gold deposits, and MVT deposits. 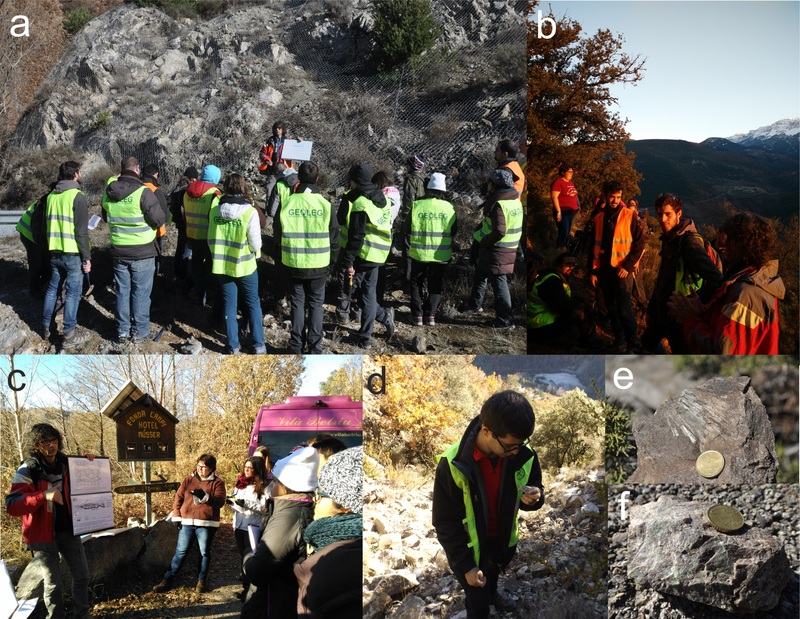 In collaboration with his students, Lluís has also published work focusing on VHMS and orogenic gold deposits, mainly in the Andes, as well as on acid mining drainage. He has worked in exploration for several commodities. 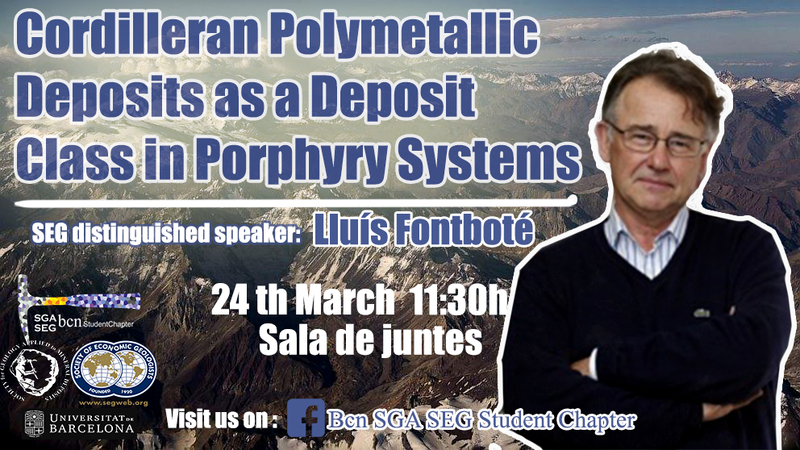 This year he is the distinguished lecturer of the SEG and we will have the great honour to have him with us giving the talk: "Cordilleran polymetallic deposits as a deposit class in porphyry systems". 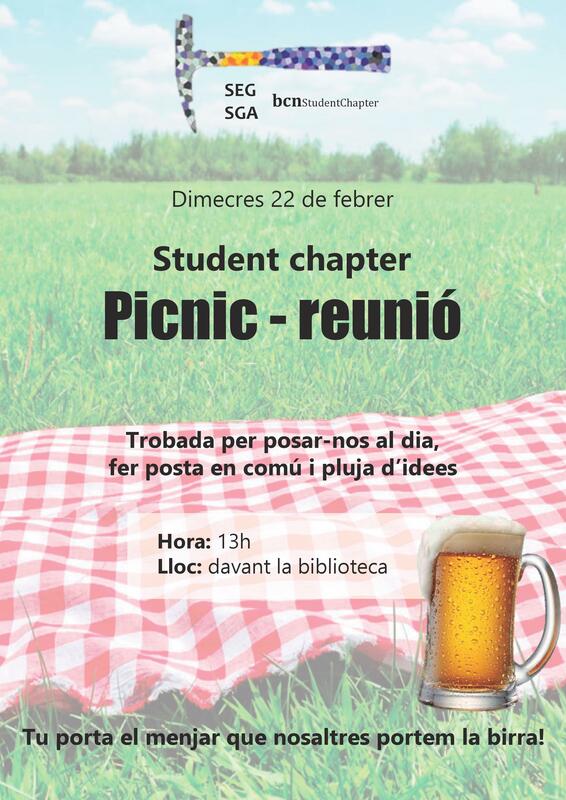 The talk will be next 24th March at 11.30h in the Sala de Juntes. 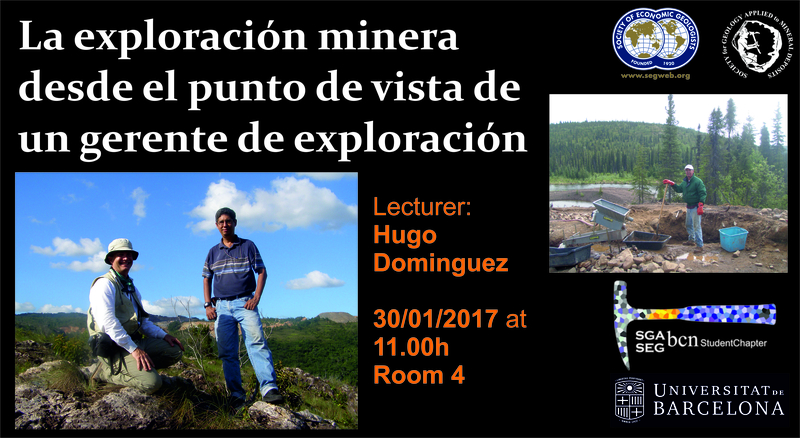 Hugo Domínguez, from Dominican Republic, will be in the University of Barcelona next Monday (30/01/2017) giving the talk: “La exploración minera desde el punto de vista de un gerente de exploración” (Mining exploration from the perspective of an exploration manager). The talk will be at 11h at room 4. 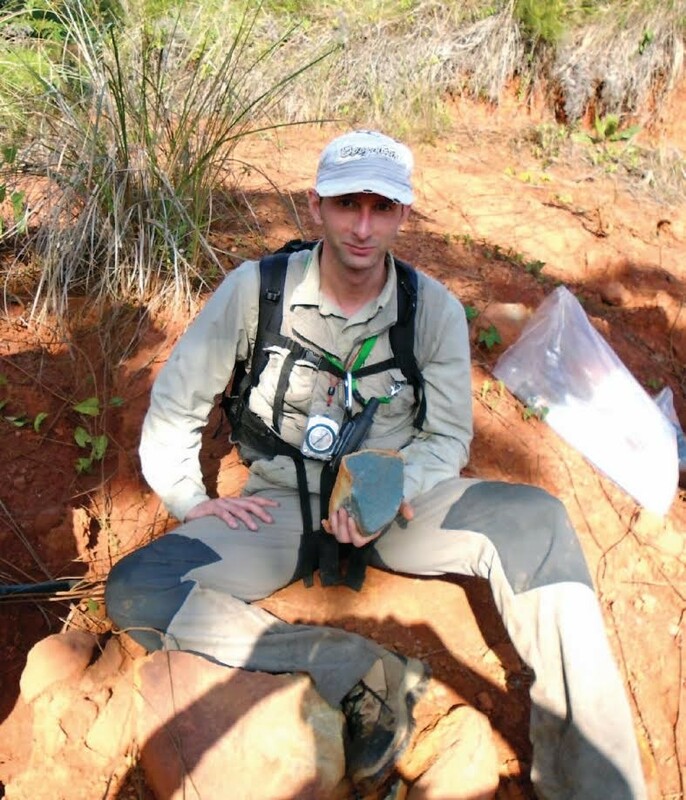 He will speak about his long experience in the exploration field mainly in Dominican Republic but also in Central and South America. He will focus on the application of different technologies such as: SIG, teledetection, mineralogy and UAVS. We would like to announce that after several years of hard work and lots of stress, one of our members, Lisard Torró i Abat, has successfully finished his doctoral thesis!Like Cristina Vilanova de Benavent, Thomas Hans Aiglsperger and Marc Campeny Crego - the members that finished their doctoral thesis the past year - Lisard was also one of our first members, and a founder of the Student Chapter. Lisard was the Student Chapter’s president 3 years ago and has always been an active member! 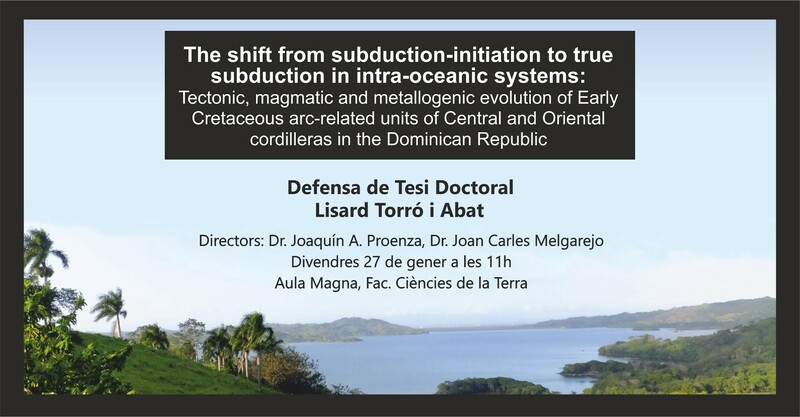 With the help of his advisors; Dr. Joaquín A. Proenza and Dr. Joan Carles Melgarejo, and our unconditional support, he will defend his amazing research in the Faculty of Earth Sciences of the University of Barcelona: “The shift from subduction-initiation to true subduction in intra-oceanic systems: Tectonic, magmatic and metallogenic evolution of Early Cretaceous arc-related units of Central and Oriental cordilleras in the Dominican Republic” the next Friday 27th of January in the Aula Magna at 11:00h. 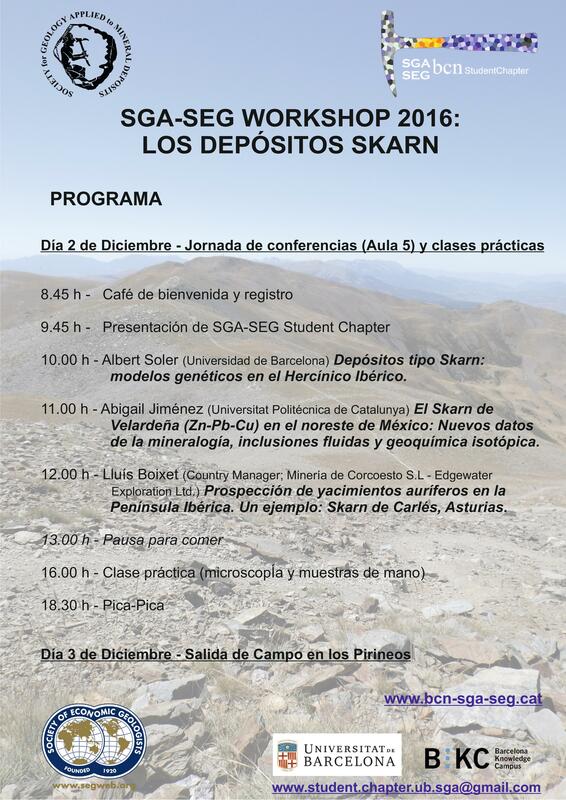 Due to the high rate of participation in the previous activities organized by the Barcelona Student Chapter, we were more than devoted to the organization of our 5th workshop dedicated to skarn deposits, which was held on the 2nd and 3rd of December at the Faculty of Geology of the University of Barcelona. 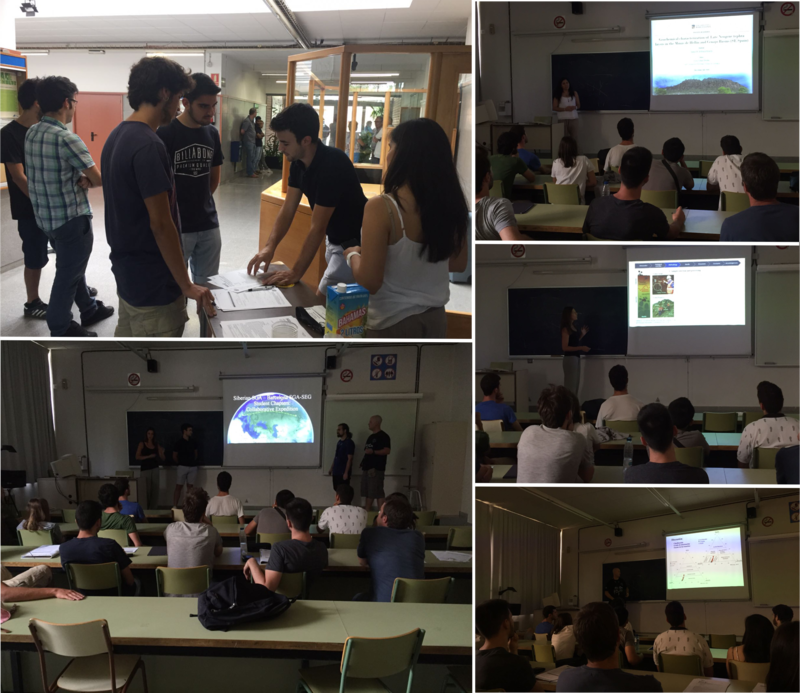 It counted with the total participation of 29 assistants, some of them even coming from the University of Oviedo, Asturias. The aim of this workshop was to provide an approach of these types of deposits regarding: their structure and genesis, their geochemistry, petrology, mineralogy and a review on the diverse techniques used in their exploration to undergraduate, master and PhD students, as well as for other professionals interested in these typology of deposit. Morning of day 2nd December consisted of a cycle of conferences in which the followings were imparted: Albert Soler Gil (University of Barcelona) opened the session with an introductory lecture entitled Skarn-type deposits: genetic models in the Iberian Hercynian in which members were enlighted with the different complex processes responsible for the formation of these deposits, their structure, petrochemistry and classification. 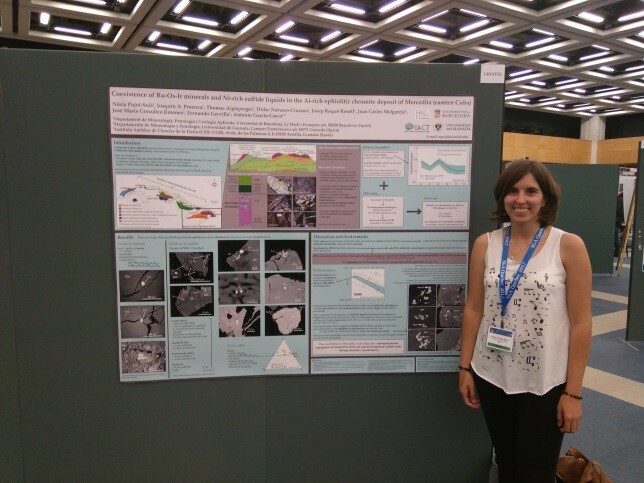 Proceeding into detail, Abigail Jiménez Franco (PhD student from the Polytechnical University of Catalonia- EPSEM) explained a particular example of skarn deposit with her lecture entitled The Velardeña (Zn-Pb-Cu) Skarn: new data on the mineralogy, fluid inclusions and isotopic geochemistry. Finally, Lluís Boixet Martí (Country Manager; Minería de Corcoesto S.L – Edgewater Exploration Ltd) treated the assistants to a memorable lecture entitled Prospection of auriferous deposits in the Iberian Peninsula. An example: the Carlés Skarn, Asturias in which members were provided not only with academic information but also with a business-exploration point of view. 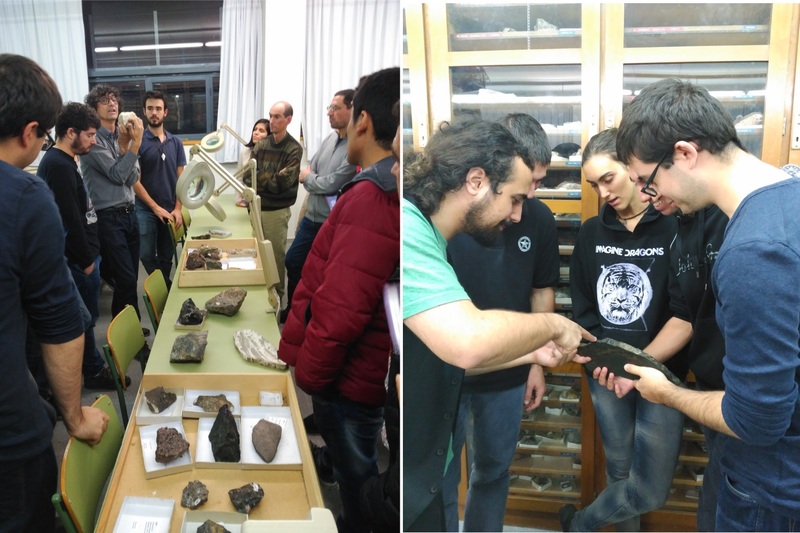 In the same afternoon, assistants were invited to a 3-hour practical session imparted by Albert Soler that included hand-sample observation of numerous skarn samples and the visualization of the ores of these ones under reflected light microscope . During this session, assistants recognized various mineralogical assemblages of different types of skarns and familiarized with those samples belonging to the deposits visited on the fieldtrip. The Barcelona Student Chapters one-day fieldtrip, leaded by Albert Soler, took place on the 3rd of December. It consisted on the observation and study of a few distal and proximal skarns located in the Axial Pyrenees, closely related to the magmatic intrusions of the late Hercynian orogeny, which included: an idiocrase skarn, a hedenbergite skarn, a pyrrhotite skarn and an arsenopyrite skarnoid (Fig.6). Assistants were deeply involved and had great pleasure in listening to all explanations regarding the processes associated to the genesis of each of these deposits and had the opportunity to acquire exceptional hand samples. We gratefully acknowledge all lecturers: Albert Soler Gil, Abigail Jiménez Franco and Lluís Boixet Martí for their overwhelming speeches. In addition we express our most true gratitude to the SGA for the economic support offered, which allowed us to develop and carry out successfully all our activities as well as to the Faculty of Geology for their logistic and equipment provided. Mineralogía y Geoquímica del Yacimiento de bauxitas Las Mercedes y otros depósitos de la Sierra de Bahoruco, República Dominicana, by Daniel García, Multidisciplinary mineralogical characterization of PGM from the Loma Caribe peridotite, (Dominican Republic), by Sandra Baurier and Geochemical characterization of Late Neogene tephra layers in the Minas de Hellín and Cenajo Basins (SE Spain), by Anna Mireia Rabaza. 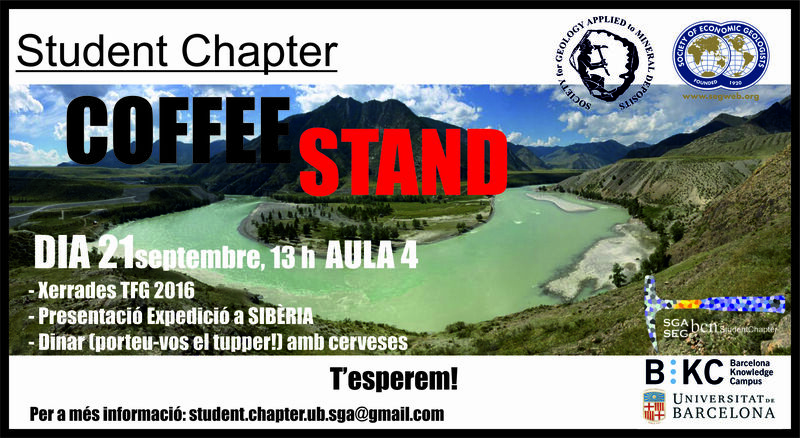 In addition, few members who attended the collaborative expedition with the Siberian Student Chapter this previous summer 2016 reported their experience in a casual and relaxed way before continuing with the welcoming celebration of the new academic year.